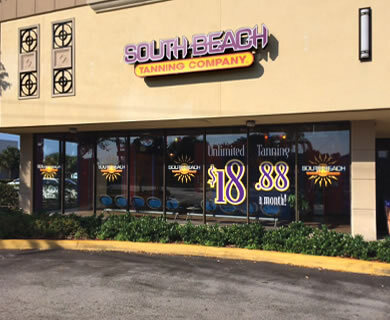 The Deerfield Beach and Pompano Beach Tanning Salon is located off of the East Hillsboro Blvd exit of i95. Go East on Hillsboro Blvd and make a right into Federal Highway. South Beach is located on the SW corner of Hillsboro Blvd and N Federal Highway in the Pet Supermarket shopping center, directly across the street from Starbucks and LA Fitness. The Deerfield Beach location is centrally located and with it being less than 5 minutes from Light House Point and Pompano Beach, it serves both of those markets extremely well with its (1/2) million dollars in state of the art equipment.